I posted this last year but I think it needs to be reposted. It follows the math symbols as a guide to distinguishing a false teaching. 2. (-) any group that subtracts from the person of Jesus Christ. "He is a good teacher" or "He was only a prophet." 3. (x) any group that multiplies what you have to do to become a Christian. It is by Grace alone though faith alone in Christ alone. If we add anything to this (like works) we are in grave error. 4. (./.) any group that divides itself as the only true church. I will come against any group that follows some or all of these practices. Can you clarify 'Word of God'? Do you mean all the books in the King James Bible (or any of the protestant Bibles)? Do you know that these books were selected from a lot of available writings, I think by the Bishop of Alexandria? Do you know that Martin Luther thought it would have been better if the Epistle of James' didn't exist? So does that make the protestant church a 'cult' (for not readily accepting the Epistle of James as Word of God)? Ofcource there are a few thing in the Epistle of St James that many people don't like to read. I think that you might be making reference to the Apocrypha. Jerome, who lived from 345AD to 419AD was a spokesman for excluding the Apocrypha books. Some of the early Church fathers, most notably, Augustine, did accept them, though not necessarily on a par with the Hebrew Old Testament. Finally, in the 16th Century the Reformers affirmed "Sola Scriptura," the truth the Bible alone is authoritative, denied the Apocrypha any place among the inspired writings. It never had had any and it shouldn't of have. The Roman Church reacted against the Reformers in the Council of Trent from 1545 to 1563, stating that all of the Apocrypha was canonical. And Protestants and Catholics have maintained the disparity to this day. If you have a Catholic Bible you'll find the Apocrypha is in the middle. Those are spurious, uninspired books. Just because Martin Luthern might have had a problem with it does not mean that the Protestant Church rejected it. "Lutherans believe that faith, is understood as trust in God’s steadfast love, and is the only appropriate way for human beings to respond to God’s saving initiative. 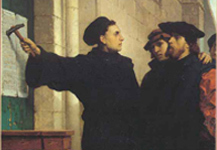 Thus “salvation by faith alone”, the distinctive and controversial slogan of Lutheranism. Opponents claimed that this position failed to do justice to the Christian responsibility to do good works, but Lutherans have replied that faith must be active in love and that good works follow from faith as a good tree produces good fruit." What about the lost letter(s) of Paul to Corinthians? I am sure there were other letters written by the desciples that are not currently in the Bible as we see today. Coming back to the original post, I believe it is impossible for us to decide now, what was added and what was subtracted. Hence we should not make that judgement to call other churches as 'cults'. Atleast God used these traditional churches to pass on the grace of God through generations. So, the best thing to do is to let them be, but incase some one asks you, you could express your beliefs regarding these churches. But to create a blog site and call them 'cult' etc, I think is not fair. How about the greed that Paul compares to idolatry? Even churches (so called prosperity churches) have fallen into the trap laid by Satan. How many times do we hear "Love of money is the root of all evil"? or "you cannot love both God and mamon". These issues are not 'fashionable' anymore. I actually agree with you on several points; especially the latter ones. I know that people think that my approach is too harsh or divisive. But I have to fear God and not man. As I mentioned in one post wolves are not coming around the sheeps gate to sing in the ear of the sheep. He is not wanting to lick the wounds of the sheep. He wants to rip the throats out of the sheep to kill them. That is what the enemy wants to do. The shepherd cannot in great Osteen style say "now sheep, you be nice to that wolf, he can be a rough customer." A shepherd has to WARN THE SHEEP TO FLEE AND CALL THE WOLF OUT BY NAME so that they will not be harmed or misled. 11who must be silenced because they are upsetting whole families, teaching things they should not teach for the sake of sordid gain. They have to be silenced. Who is going to do that? Who is going to call them out? I see it in a different way. I can see a Master who has a lot of sheep and has many servants to look after the sheep. 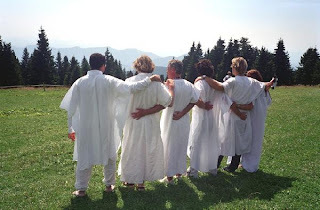 These servants go about talking to the sheep entrusted to other servants and tell them they are really following wolves. Do you believe, "No one can confess Jesus as the Lord without the Holy Spirit"? I often consider the possibility of me being wrong when there are contadictions in what I believe. It would do you only good if you also do that. As Paul said "If you think you know something, you know nothing yet as you ought to know"
In reference to your question I am reminded of Matt. 7.22. Are you saying that we are all right or better yet all roads lead to Heaven? what we see here is the neo-deist,neo-pelagian, hyperarminian twadle that is being proclaimed today. The believers I fellowship with do not reject James. However there are many in post-modern "christianity" who reject the validity of the entire Word of God, (which does not include the apocryphal writings btw). I think Abraham is going the long way around to show that he most likely does not accept the Word as authority, or he is arguing that men wrote the book, and men assembled the book, which leaves it open for man's discussion, a distinctly papist argument. James as well as the entire Bible was written by God, through chosen men of God, for the people of God. So I have no problem with James, as he is speaking about works exhibiting the justification of those who already believe. He is not saying that works save us. Eph 2:8-10 must be read right along side James' letter. As for the rest, any "lost" letters are lost for a reason. Finally we are all aware of the wrongs of the visible church, and the disobedience to the Word of God that is caused by rejection of the Word, 1 Samuel 15:22-23. Don't try to lay the blame on Luther or the diligent, and true, (non-hireling) shepherds. I am not saying you are wrong about your observations with the Catholic church. I just don't believe such blogs would help people in understanding that. I would say, prayer and fasting would be of more help. When God speaks to men's hearts, it is much more powerful than people trying by themselves. Is it too hard for people diligently seeking God to find out that something is amiss with traditional churches? The original printing of the King James Version included the Apocrypha, so named in the text. It contained all the books and sections of books present in the Latin Vulgate's Old Testament but missing in the Hebrew. Under the Thirty-Nine Articles, the doctrinal confession of the Church of England established in 1563, these books were considered non-canonical but were to be "read for example of life and instruction of manners"
So somebody made a decision to drop this from KJV. I also read about the Book of Enoch that is referenced in the new testament. Apparently this book always has been in use in the Ethiopian church. To suggest that Paul referenced some book that is not inspired by the Holy Spirit wouldn't be right. Again, all I am saying is, lets not define 'cult' based on what that church consider as inspired by God though these writings are not in Protestant Bibles. The fact that the apocrypha was in the original KJV is well known, and means nothing.The apocryphal writings, all OT by the way, were excluded from the original canon by the jewish rabbis long before the KJV came along. They were viewed as semi-historical but not scripture.The 39 articles rightly corrected this issue. The roman catholic church kept the apocryphal witings,which reflects their rampant anti-semitism, and anti-protestant doctrine. As for Enoch and the other apocryphal writings that Paul quoted, if they were considered to be canon, the apostles and Jesus would have quoted them more than they did. Jesus never did reference these writings directly. Paul also quoted the Greek poets to the stoics in Athens at the Aeropagus. Do we now include Greek poems as inspired Word? The quotes they referenced are for a specific purpose, and are not a tacit endorsement of the books they are contained in. The Ethiopian church, and all eastern orthodoxy is as off base as Rome is. We have the Canon and it is sufficient. What you are advocating is the canonical equivilent of the altar to the unknown god, Acts 17; i.e. let's leave twenty blank pages in every Bible we print,in case we missed a book. Alright.. I don't wish to continue arguing. I am not a scholar in any of these. Just a spirtual 'baby'. I hope you guys got the point that I was trying to make. Faithful are the wounds of a friend;profuse are the kisses of an enemy. It depends on what the offense is that is wounding us. Thank the Lord for His wounds. I know that you said that you were finished but I must admit; I have not really gotten your point. The only thing that seems to be where you are going is you think that there are other sources of authority besides the Word of God as we have it now. My point was, we need to concentrate more on the problems in ourselves, our family and our church, rather than look around with others, other family and other church, in that order. Do you give the same importance to(for people to abstain from) fornication, divorce, etc in your church, as much as you try to prove other churches are cults? How about covetousness/greed which is idolatry? How much we all "love the world and the things that are in the world"
I would say, the above issues are far more important for any church than for them to find out how wrong others and other churches are. The most important quality when we need when we kneel down to pray is humbleness. The realisation that we still are not living as God want us to, and more we need for Jesus to intercede for us. We should not be saying, "Thank you Lord, that we are not like the Roman Catholic Church, or like Rick Warren". Instead, we should be saying "Lord, there is such and such problems with us, help us to win over these sins that You may be able to use us better"
May God bless you and your church, Brother. There is still a lot to change in all of us. Don't you think we need to draw a line somewhere to distinguish between a wolf and a brother who interpreted the scripture in a slightly different manner? For example, if someone preaches that Jesus was a good teacher, but was just another human being, I would say he is a wolf. But I wouldn't call people like Rick Warren wolves. Even Apostle Paul had difference of opinion with Apostle Peter. But they didn't anathemse each other and forbit their congregation members from having any fellowship with each other. That is why I am trying to do. Please consider looking at my previous posts about Warren.